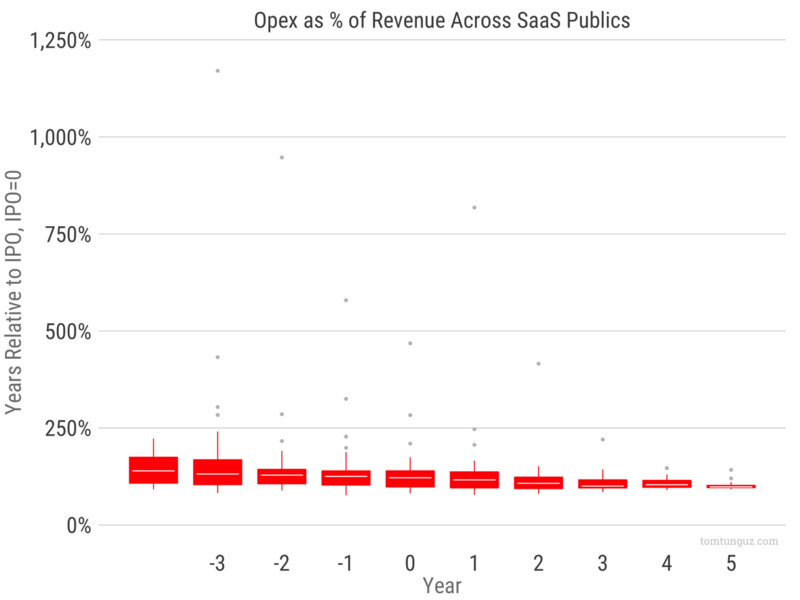 What Percentage of Revenue Should SaaS Startups Spend on Payroll? What percentage of revenue should be spent on payroll? In 2001, Salesforce spent $35.6M on payroll and generated $5.4M in revenue. 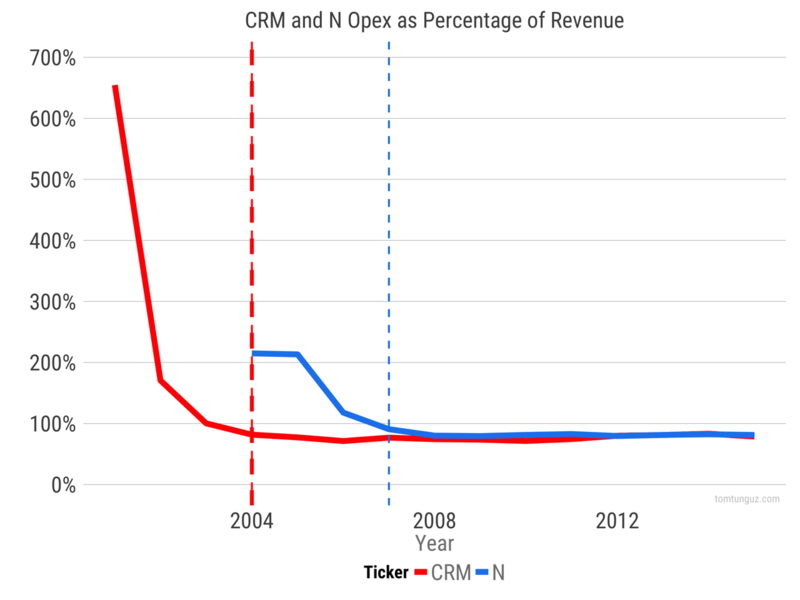 NetSuite spent $38M on payroll generated $17M in 2004. as both of these companies scaled and approached IPO, the operating expense ratio (OER) or operating expense divided by revenue, asymptotes to 0.8. For every dollar of revenue, both of these companies spent $0.80 in payroll at scale. The OER is a metric of efficiency. How many salary dollars does a business invest to generate one dollar of revenue. The lesser the OER, the more technology leverage the startup can exacts. If the greater the OER, the greater the reliance of the business on employees to scale revenue. Looking at all publicly traded companies, we see quite a few outliers. Hortonworks, Xero, Castlight and DemandWare spent 4x, 7x or 11x their revenue on payroll at some point in their trajectories. In the cases of services-dependent software, companies may have to ramp payroll before being able to recognize income, thus pushing the OER higher. Other businesses may have very high OERs because they have amassed a large enough balance sheet to finance larger operations. In still other cases, big customers may have paid upfront and cash might be coming in, but again revenue recognition depresses revenue. Let’s exclude the outliers and look at the core. Just a reminder about box plots. The white line in the middle of each box is the median. The top and bottom parts of the box are 25th and 75th percentile. The whiskers extending from the box indicate the maximum and minimum that are within 2 standard deviations of the mean. The little dots are outliers. 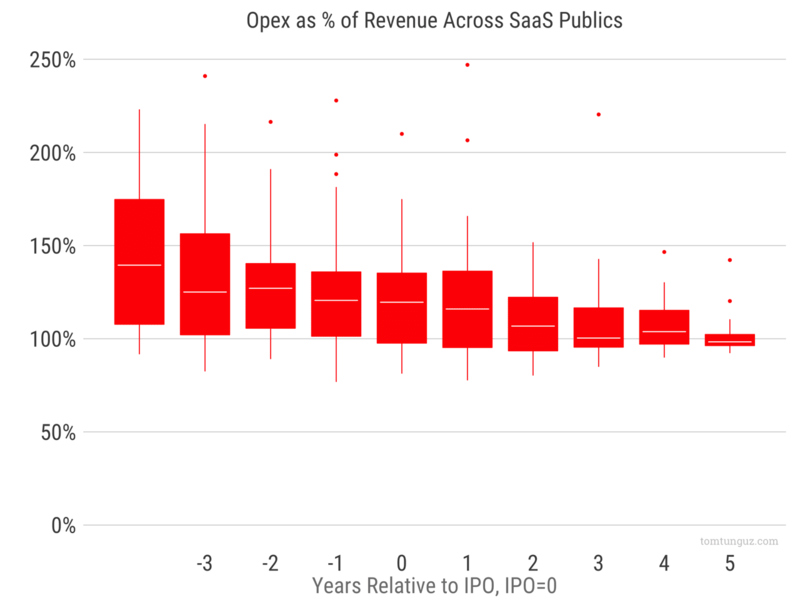 The median public SaaS company spends 140% of revenue on payroll 4 years before IPO and slowly decreases the ratio to 125% during the year of IPO. How does this apply to early stage companies? Businesses without revenue have infinite OER, which isn’t very useful at all during the earliest stages. At the Series A, a venture-backed SaaS startup in the Bay Area with $1M in revenue is likely employing somewhere around 20-40 people, and spending $3-4M per year on salaries, implying an OER of 3 to 4. At the Series B, the business might be at $5M in ARR with 80-120 people and spending about $14M on salaries, again producing an OER of around 3. But there isn’t much publicly available data at these earliest stages because public companies aren’t typically required to disclose these figures. But as a company scales, the benchmarks become clearer.